With the average marketing database being full of bad data, marketers must be proactive to prevent their systems from becoming contaminated. Duplicate contacts, invalid email addresses, and incomplete prospect info can plague your database, undermine performance, and consume a lot of time and resources. 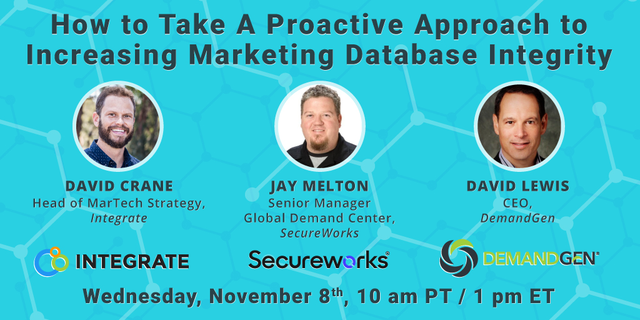 Join DemandGen, Integrate, and SecureWorks on Wednesday, November 8th at 10am PT / 1pm ET for a webinar on adding integrity back into your database. P.S. – Unable to attend? Register now and we will send you a link to watch the recording after the session.